Home Arezzo and surroundings Fett’unta: good Tuscan snacks, very fair prices! 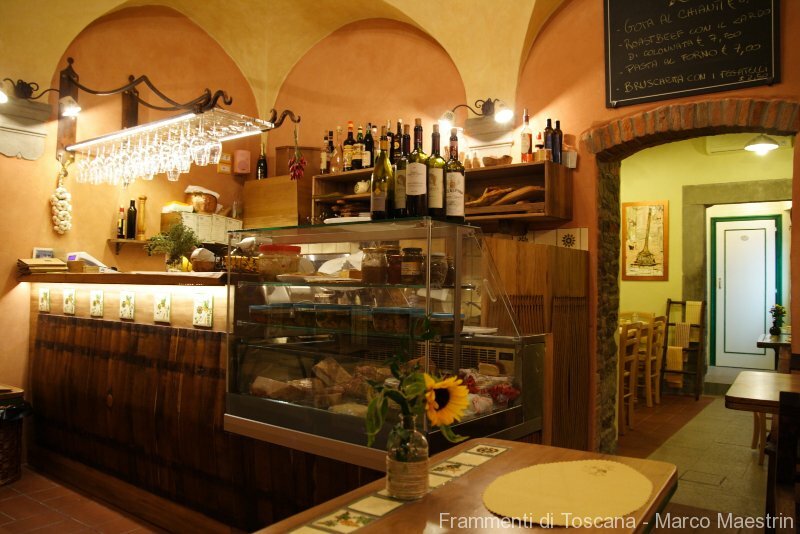 Fett’unta: good Tuscan snacks, very fair prices! During our visit to Cortona we found “La Fett’unta”, a nice country stuzzicheria (a snack bar serving typical Italian little plates) opposite to the popular Osteria del Teatro, in Via Maffei, at a few steps from the central Piazza Signorelli. Despite its small entrance, we were attracted by the menu on the wall next to the entrance door, and the voice of a man speaking inside and congratulating the restaurateur on the food he ate the day before at lunch. He was so satisfied that he had decided to show his wife the place. We were even more attracted by the place and carefully read the menu: bruschette (toasted slices of bread topped with various ingrediets), schiacciate and ciabatte (typical breads stuffed with vegetables and/or sliced ham or salami), salads and soups and fair prices: bruschette’s ones range from 2€ to 3,5€, schiacciate and ciabatte from 3 € to 3,5 €, salads cost about 4 €. Salami and ham on cutting board are a little more expensive, but still more than affordable (around 10 €). It was the right time for an aperitivo, we went in and were warmly welcomed by the restaurateur . The place is small but not suffocating: there is a small room immediately after the entrance, in the same space when the counter is located (a classic counter as in the old times, with every sort of cheeses, hams, salamis, and breads), and another bigger room, just next to the first one. We ordered two bruschettas (mine was topped with sheep cheese, nuts and pears, in perfect Autumn style! ; Marco’s one with gorgonzola cheese and honey, but there were many others that would have been worth a taste), and two glasses of Syrah wine from Cortona. Bruschettas were excellent, wine was wonderful, and this aperitivo in a so nice and characteristic place only cost 6€ each. We’ll go back there for another snack, and also for lunch: besides bruschetta & Co, we have read that also meat plates, lasagne, and other kind of pasta can be ordered. Good to know, as unfortunately the worst aspect of Tuscany is that often, especially in beautiful and touristic places, restaurants and bars are very expensive, and food is not as good as expected to be for the price paid. This nice place is different, and we recommend it to people visiting Cortona and willing to have a light lunch or a snack in this marvellous town. Buon appetito! Questo blog non rappresenta una testata giornalistica in quanto viene aggiornato senza alcuna periodicità . Non può pertanto considerarsi un prodotto editoriale ai sensi della legge n° 62 del 7.03.2001. Gli Autori non sono responsabili per quanto pubblicato dai lettori nei commenti ad ogni post. I commenti ritenuti offensivi o lesivi dell’immagine o dell’onorabilità di terzi, di genere spam, razzisti o che contengano dati personali non conformi al rispetto delle norme sulla Privacy saranno rimossi. Gli Autori del blog non sono responsabili dei siti collegati tramite link né del loro contenuto che può essere soggetto a variazioni nel tempo.